Being anonymous is simply not an option when you wear a 1930s style fashion suit that looks like it came right out of the Cotton club. 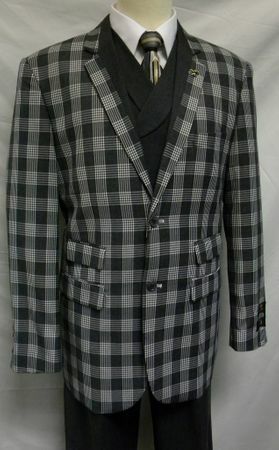 This charcoal plaid jacket fashion suit is made by EJ Samuel. Designed in Italy with the 1930s in mind, you'll certainly be the talk of the party wearing this sharp looking suit. Featuring a 33 inch long jacket with side vents in the back and in your face wide lapels. The pants are wide leg style baggy and pleated. Made of wool touch Poly/Rayon. Checkout the Rest of Our Selection of Zoot Suits Here. This is a Final Sale item.